Offering you a complete choice of products which include stainless steel lockers. The Stainless Steel Lockers used in Sterile Area. 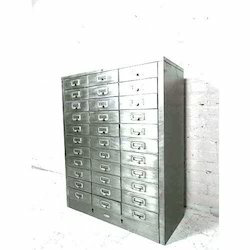 This cabinet is fabricated from superior quality Stainless steel 304 (18G).Fabricated by using the best quality stainless steel, the Stainless Steel Lockers are used in pharmaceutical laboratories and hospitals for storage purpose. The distinctive features of these lockers are their superior finishing, proper ventilation mechanism to preserve the original quality of stored product, easy handling system and premium quality. Apart from their rust proof design, these lockers are featured with advanced lock system for the safety of stored items. Looking for Clean Room Furniture ?